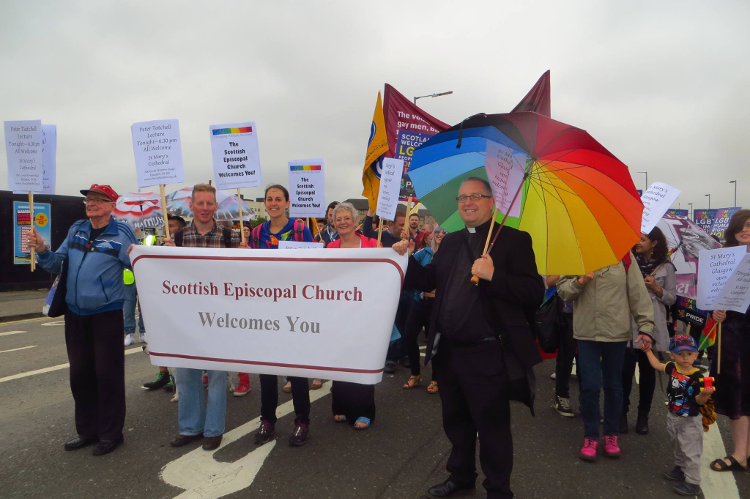 St Mary’s has a Lesbian, Gay, Bisexual and Trans network which is responsible for organising meetings and events, including helping to organise those Episcopalians who want to march at Pride. Meetings have included a meeting with Bishop Idris, now the former bishop of this diocese, our current Bishop, the Rt Rev Gregor Duncan, bible studies on what the Bible really says about gay relationships and various social nights. We’ve also had evenings on art, books and have invited speakers to address us. St Mary’s has a clergy team which has both straight and gay members. St Mary’s has been a welcoming place to gay and lesbian people for many years. The Provost talked about this in the following video which was used as part of the campaign for Equal Marriage in Scotland. A number of members of the church were involved in gathering the original signatures for the petition which led to this legislation. The contact person for the LGBT network is Beth Routledge who can be contacted using the form below.